As the second anniversary of Madeleine's abduction approaches, there is much still to be done. We continue to remain focussed on our aim - to find Madeleine and bring her back home safely. As Madeleine's parents we cannot and will not ever stop doing all we can to find her. The search for Madeleine continues with the same strength and determination, and thankfully, there are many people who are continuing to help in a variety of ways. The reduction in media reporting does not signify a lack of effort - far from it! If anything, the search for Madeleine goes on with renewed vigour and great experience. We have quietly and persistently been working very hard - exploring all possible avenues in order to get that key piece of information. Someone somewhere knows where Madeleine is. It is impossible for us to ignore the day to day heartache of missing Madeleine but there is however, a very important and positive fact that remains.... In spite of all the investigative work done, there is still absolutely nothing to suggest harm to Madeleine and therefore, a very real likelihood that Madeleine is alive and well. You only have to recall the cases of Elizabeth Smart, Shawn Hornbeck and Natascha Kampusch to appreciate that children can seem to disappear 'off the radar' for very long periods of time. The return of these children to their families not only gives us great hope but also starkly emphasises that perseverance is essential, and surely what every such child deserves. Since Madeleine's abduction, we have learned a lot about missing children and child exploitation. The scale of the problem is massive and worldwide. Although finding Madeleine will always remain our priority, we feel it is our duty to highlight these problems as well as areas where legislation can be improved, in order to make the world a little safer for all children. To achieve these aims we are working closely with the International Center for Missing and Exploited Children, the Centre for Child Exploitation and Online Protection and other non-governmental agencies throughout Europe ( Investigation page). The Find Madeleine Campaign launched a new YouTube channel for missing children in August 2007 called 'Don't You Forget About Me' in conjunction with ICMEC and Google. It is vital that we never, ever give up on Madeleine. And so, we will never, ever give up. 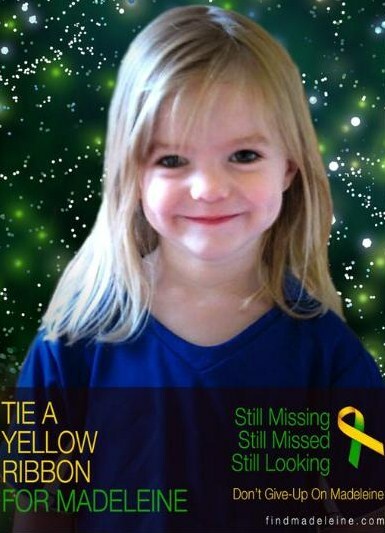 We urge you to remember Madeleine as a real, living and findable little girl. Our most sincere thanks go everyone who is helping us in our efforts. You know why we must keep going.